Whether you’re seeking pain relief or relaxation, Vitaphysical offers a full range of massage and osteopath services just a short trip from South Shields. Our professional and experienced team of musculoskeletal practitioners tackle everyday problems that cause you pain and discomfort, restoring function and freeing you from niggling aches and soreness. We also treat those who have suffered an accident or injury, developing a tailored massage therapy or osteopathy programme to restore your health and fitness. At our clinic we deal with patients who suffer from problems such as sciatica, whiplash and wrist pain, as well as treating those with sports injuries. We host a back pain and frozen shoulder clinic too, addressing these all-too-common problems that can impact so painfully on people’s everyday lives. 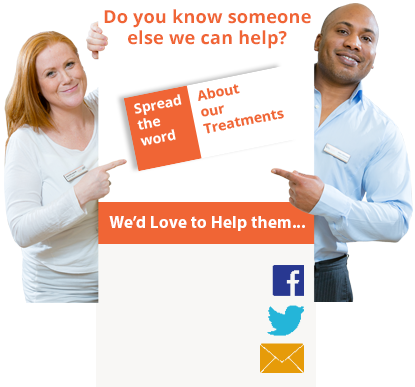 You can find a list of the conditions we treat and cure on our what we treat page. Not sure how to classify your personal condition? Give us a call now. We offer discount on your first consultation, guiding you through potential courses of treatment and identifying what type of massage therapy or osteopathy would best address your individual needs. Because the Vitaphysical team is made up of qualified specialists in their fields, we can match you with a therapist who has lots of experience of successfully overcoming problems like yours. Our welcoming team is led by Vitaphysical’s founders Jason (osteopath) and Bronyia (massage therapist). Working alongside them is massage therapist Emma, and sports massage therapist Kirsty, who specialises in sports massage as well as offering mums-to-be relaxing pregnancy massage. Over the years we’ve found our clients come from all areas in and around South Shields and they are generally referred to us through word of mouth recommendations. We are exceptionally proud to be able to share some of our patient success stories on site. The Vitaphysical centre is located close to the A19 and near to Sunderland train station and metro station, which means we are just a short trip from South Shields. You can find more details on how to reach us on our contacts page. To book your osteopath or massage appointment you can call us on 0191 565 8886 or use our online booking system. If you’re visiting Vitaphysical for the first time you can take advantage of our discount offers and claim up to £10 off your consultation and first treatment with us.